Prime Minister Tony Abbott has confirmed Australia will acquire two additional Boeing C-17 airlifters. The Royal Australian Air Force’s 36 Squadron already operates a fleet of six C-17 Globemasters from its Amberley base, with the seventh to be delivered in July/August and the eighth aircraft to be delivered by the end of this year, the Prime Minister announced at Amberley on Friday. The $1 billion acquisiton comprises $700 million for the two aircraft plus sustainment, and a further $300 million for a new, dedicated C-17 maintenance hangar and aircraft hardstand and taxiway upgrades at Amberley. Currently 36SQN utilises the KC-30 maintenance hangar at Amberley when needed. “The two additional C-17s will provide vital heavy airlift support to a range of regional and global coalition operations and greatly increase Australia’s ­capacity to provide rapid and effective disaster rescue and relief and humanitarian aid,” Prime Minister Abbott said. The acquisition of the two extra C-17s was first announced by then Defence Minister Senator David Johnston last October. At the time Johnston said Australia would also consider the acquisition of a ninth and tenth C-17, with decisions regarding the acquisition of those aircraft to be informed by the Force Structure Review being developed as part of the 2015 Defence White Paper process. Then on November 12 a US Defense Security Cooperation Agency notification revealed Australia had formally requested “up to four” more C-17s from the US government. With production of the C-17 ending this year, Boeing has built about 10 “white tail” aircraft in anticipation that these could be sold to new or existing customers of the airlifter. New Zealand has shown interest in two while there is believed to be interest for additional aircraft from India, Canada and the UK, as well as new customers in the Middle East. Australia initially ordered four C-17s in 2006 which were delivered between December that year and January 2008. The fifth and sixth aircraft were delivered in 2011 and 2012. “Boeing is honoured by Australia’s decision to acquire two additional C-17A Globemaster III aircraft, which further highlights the enduring relationship between Boeing and the Commonwealth,” Boeing said in a statement welcoming the announcement of the additional aircraft. Sweet. I wonder how they will go with trying to get a hold of the 9th and 10th airframes? Would the US be applying some kind of fairness test to its FMS customers or would it be a case of first come, first serve? I think this will be good for the A400M as well because those customers that miss out may decide they definitely need a heavier airlift capability and go looking for the next most capable aircraft. In the off chance that there is enough renewed interest in C-17 purchases from new and existing customers, would Boeing keep the line open or has too much of the supply chain been closed down already? Fingers crossed numbers 9 & 10 are committed to. Its a case of snooze and you loose. The final C-17 entered final assembly about a month ago, and it seems that everyone and his dog want to grab some of the white tails. Will there be any room left at Amberley for the C-27J? Might have to leave them at Richmond, we’ll keep them. This is fantastic news.I always thought the initial order was way low.These two jets coming from the “”white tail”jets.That is to say ,there were 10-12 aircraft built without customers before the production line closed.The quick delivery mentioned in the press release now makes sense to me. Dane – the production line wind-down is irreversible. Short of outright war and the US somehow needing more C-17’s, it is highly unlikely any more will ever be built. I think you’ll find that the US has a surplus of airframes anyway. We should put our hands up for the last remaining two units, to bring the total to 10 before they get snapped up!! As for NZDF to buy two it seems a bit far fetched as the C-17 may to big for them to buy, I think KC-390 would be a better fit for them….. These planes have to have been one of the best military purchases for a long time. It’s tempting to say that other branches of the armed services should be made to look more carefully at the “vanilla” option before the rush to customise, and for us to then see costs and timelines out the window. Hmmm…no one seems upset that these airframes were constructed overseas and we bought them without consideration for local build /sustainment? But we’re not talking submarines now are we…I always wonder what fuss unions would cause if we had a large aircraft manufacturing industry. Would we get the same foot stamping and war cries of “jobs for Australians” or “what if the U.S. stops sending spares or support etc…”? I wonder if the RAAF will get more C-27j as they are interested in the gunship version the MC-27j? I would think that the 9th and 10th aircraft have been reserved for Australia and waiting for confirmation by the Force Structure Review. If the review says no more are needed. then they will be allocated to the next buyer. The first principle of procurement is to define a need. If the need is black ops sneaking around in other peoples harbours. Perhaps a smaller style of submarine like the O class would be more effective or a PBY Catalina dropping/picking up special forces. It is fantastic news, it would be great to see the extra 2 ordered to take it to 10 because that is i think the right amount for the raaf especially with how hard they are being worked. As much as i love the order for more of these aircraft i think the more pressing matter is kc-30’s, don’t have enough of them and the logic of buying 5 is something i can’t understand. I would like to see, even though it won’t happen the government order 5 more of them. Guys – since David Johnson made comments about 9 & 10, iron ore prices have halved and coal has done much the same. Nationally our GDP is going down as is the amount 2% GDP (Defence) will buy – our dollar approaches the Kiwi in value. Probably our best hope is that we can buy 2 more KC-30’s, as the Greek tragedy has kept the Euro down. Can someone get me up to speed on these Growler F-18″s.I was under the impression that the 18G technology was built into our E/F models,but see some extra airframes coming off the production line in another article here. I agree on the need for more tankers,and perhaps more C-17’s.Its all good and well to say you have an aircraft that can do the job of 2 or 3 Herc’s ,but if you need two or three aircraft for different projects ,then it is a moot point. Do we really need F18s to do what we do in in Afghanistan and Iraq, Hawks could do that job. Had an interesting chat with an ex Army Air Corp pilot at Avalon who liked the Lynx helicopter for its versatility, you could remove the guns and deliver hay to area hit by blizzards and floods, while the current attack helicopters were only good at one thing. Australia seems to be buying specialised kit which end up being never used for what they were bought or anything else..
We should take the fleet total to 12 while we can. We could then reduce airframe time so the fleet would last decades and also have extra capacity in times of crisis. Given that Australia often find itself engaged in all directions of the compass and given the volatile nature of the world politically and highly probable increase in natural disasters as a result of climate change, 12 C-17’s would be good policy. As others have pointed out, with the drop in the dollar and exports, I’d think numbers 9 & 10 are unlikely, but we’ll see soon enough I suppose. Also, with the C-17s getting their own maintenance hangar, I wonder if this is partly because of an expected increase in the numbers of KC-30s? The gov’t have certainly suggested as much, but this could be part of the prep work for it. This year will be (as always) an interesting Fed Budget. @Daryl, the final 12 of our original 24 F/A-18F Super Hornet order were pre-wired to allow conversion to EA-18G Growlers at a later stage. That option was not exercised however and an addition 12 (for a total of 36) EA-18s were ordered. FA18B+ Hornets were not sent to Afghanistan because they have the least airframe life left. So single seat FA18A+ were sent with the NG Litening III targeting pod on the centre line pylon. Our Hawk 127 can use the same pod on the same pylon 4 and still carry 2 external fuel tanks and smart weapons on pylons 2,3,5 and 6 and WVR AAM on pylons 1 and 7. Afghanistan does not need targeting by helmet in a dogfight. From a cost effective perspective the Hawk which is high subsonic without afterburner on one engine has the advantage of one pilot flying whilst the other concentrates on the ground situation. The Hawk 127 has a data link and EW system. Loss of a Hawk undertaking CAS and FAC(A) would cost less than a Hornet, Super Hornet or F35. The fixed FLIR in the Hawk 127 nose gives redundancy if the NG Litening III goes unserviceable. It is good to send the classic Hornets over to Iraq to conduct the operations, the reason being is that it allows them to keep the flight hours of the Super Hornets down. They don’t want to put the hours of the Super Hornet at this stage right up, the classic Hornet only has a few years remaining before it is retired and is capable of performing the role. So it makes perfect sense to use them instead. Since when have we sent F/A-18 Classics to Afghanistan? I thought they were only operating over Iraq? For C17s 9 and 10, let’s wait for the Force Structure Review. I could be wrong but I am certain that we never delpoyed F18s to Afghanistan. We sent them to the Middle East for the second Iraq war and now the ISIS operations. Gary and Craigy you are right, we should have sent RAAF CAS and FAC(A) support to Afghanistan but didn’t. I was of course referring to the Super Hornet then Hornet deployments to Iraq but did not name it properly. Geoff the Hawk 127 can carry a 30mm cannon on the centre line pylon 4. aSRAAM and Sidewinder WVR AAM on wingtip pylons 1 and 7. Plus weapons on pylons 2 to 6. Pylons 3 and 5 are plumbed for external fuel tanks. The fixed FLIR in the nose has a LASER designator for Paveway series weapons. Besides the Hawk 127 data link the NG Litening III targeting pod has a Video Down Link to FAC / JTAC on the ground with GPS coordinates. LIFT need al these things to function properly. The other thing we should have sent to Afghanistan was our own CSAR helicopters. Given the problems with the Taipans some Blackhawks should have been equipped with EW and LASER protection like the Chinooks. The VDL works with the JTACs ROVER computer. Craigy, correct mate. Fast jets have only been deployed for ops over Iraq under Operation OKRA. I think this is awesome for Australia and the RAAF. I do hope they RAAF do get a 9th and 10th C-17 but an 11th and 12th new C-17s would be awesome! Also the Government and RAAF should look at buying second hand C-17s built between 2012 and 2015 with very low cycles and flight hours to bolster our strategic airlift capability with a future fleet of 24-48 C-17s along with replacing then 12 C-130Js with 24-60 A400Ms to also replace the retired C-130H models and grow our air force capabilities. On another note does anyone know if and when Australia will be getting any more KC-30s? we need at least 7 additional KC-30s for a fleet of 12 but even then a fleet of 12 KC-30s seems way to small anyone else agree? I’d put a figure of at least 24-36 KC-30s is what it should be. Yet again, way way too much Red cordial! Read the instructions, ou are not supposed to drink it straight, you have to water it down a bit mate! I haven’t heard the red cordial comment like that in a looooong time. Thanks to you both for a good laugh for that contribution. I think many have been on it (external to this site) of late. So if there are 2 more on order after these there won’t be too many left. I honestly don’t thing the economy state of play re mining has too much to do with the military at present. The financial situation of the world is really on the edge of what was avoided in 2008 by getting out of a debt problem by getting into a totally unserviceable debt problem now via more debt. So, this is a real global instability thing we are all entering. Don’t think for a second that this hasn’t been added to the resource equation for threats going forth. In trading perspectives, it is a risk on time coming relative to this. There are only so much printing by central banks and passing the debt of to the people that a government can accommodate. Most major economies are in unsustainable situations globally right now. You see our government ramping up laws left right and centre for example.. Cheers guys, keep up the good (with the odd humour here and there) posts. 12 C27 Spartans, 12 Embraer KC 390’s-to replace the C130J-30- 10 KC 30’s and 10 C17’s would nicely round off our transport fleet. Add 12-16 PC 12’s for light transport/training to replace the King Air 200’s. Elsewhere it notes that funding for replacement airlift has been provided for in the most recent defence capital plan (the DMRR), and that consideration was being given to bringing it forward (presumably from the approx. 2020 retiement date of the C130s). Note the Select Committee contains members of both main parties and they seem to agree that C17s would be ‘very desirable’. This isn’t just a fantasy of internet defence enthusiasts any more. I suspect if a deal can be done with RAAF around training/simulator access and a common spare parts pool, then we will see two C-17s wth a kiwi roundel on the side. 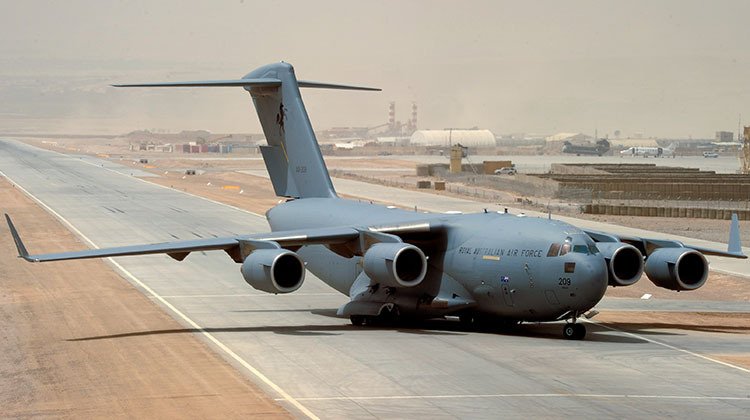 If that happens, the Australian gov’t may back off from aircraft 9 and 10, figuring two more ‘friendly’ C-17s in the neighbourhood are good enough, and the money could be more usefully spent elsewhere.